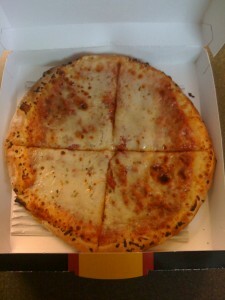 On my way to Austin, I made the mistake of grabbing a mini pizza pie at the Pizzeria Uno kiosk in Palm Beach Airport. Since my options were donuts, gross looking burgers, or gross Pizza, I chose the pizza. I am sure the others would have been equally as gross. Maybe I am mistaken Pizzeria Uno as being a place that serves deep dish pizza, but this pungent pie was nothing like deepdish. The dough was rubbery, and the cheese tasted totally processed. There wasn't much I liked about this pizza, including the absurdly high price. If you are heading to the Palm Beach airport, do yourself a favor and try to eat before you get there, so you do not have to encounter this crap. I mean at least put a little effort into the below par pizza you are serving, for the $8 + price you charge. Pizzeria Uno in Palm Beach Airport gets 1 out of 8 slices.